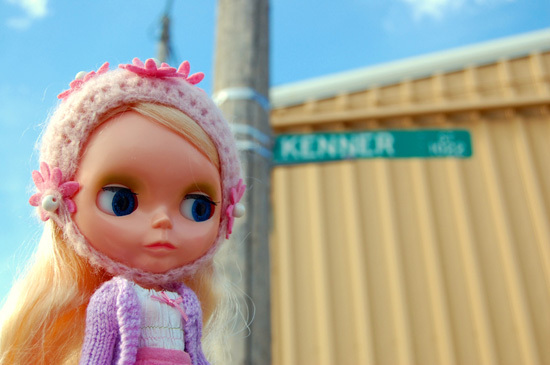 BlytheLife.com » Interview with Becca a.k.a. Blythetastic! I had the pleasure of meeting Becca in person at BlytheCon Seattle in 2014! 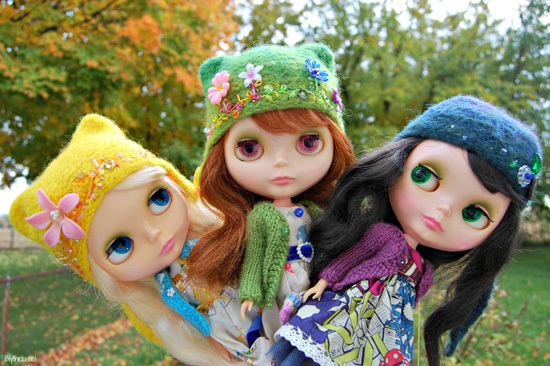 You may know Becca better by her online screen name: Blythetastic! She’s one of the nicest and most genuine people that I have ever met, and now I’m introducing her to the rest of you. Hi Becca! Tell us about yourself. Hi! 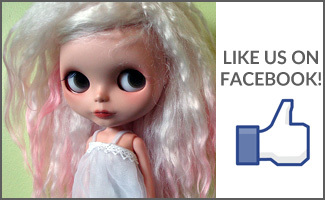 I’m Becca, but you might know me as Blythetastic online. 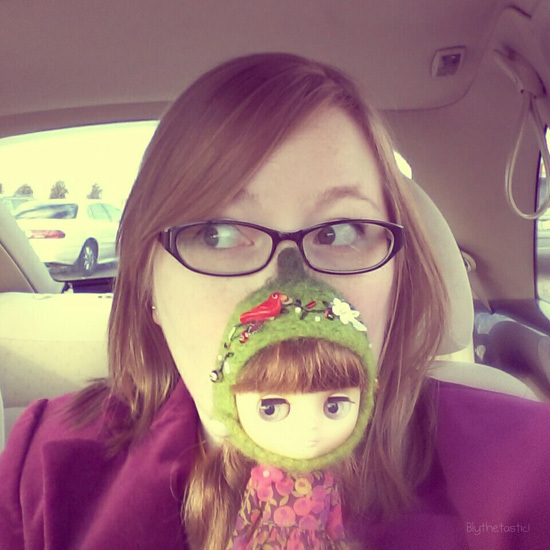 You may also know me as livestream Becca from BlytheCon. I ran the livestream video feed of BlytheCon Dallas in 2012, BlytheCon New York City in 2013, and BlytheCon Seattle in 2014. I live in southern Ohio, near Dayton, and I’m a Sign Language Interpreter. I’m a fourth generation doll collector. My great-grandmother and grandmother collected dolls. Now, my mother and I both collect dolls, too. Funny enough, I’m the first one in our family to collect Blythe. I had seen a few photos of these large eyed dolls floating around online but I wasn’t sure what they were called. I had recently discovered a band called Eisley and read their blog quite often. 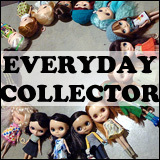 One member of the band, Sherri DuPree-Bemis, collects Blythe dolls. 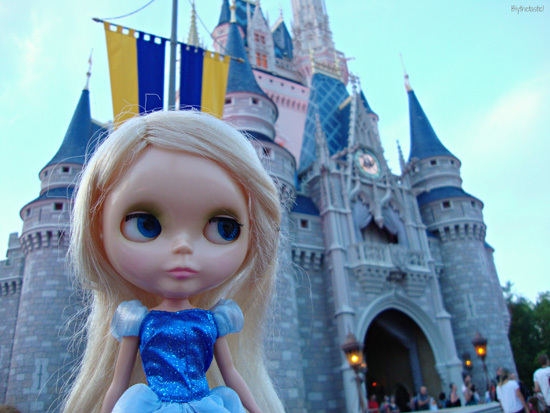 She received one as a birthday present, a Tailor Gibson, and post a photo of her new doll on her blog. 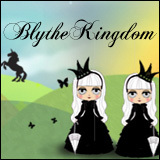 As soon as I knew what they were called, I began reading all about Blythe. I was fascinated! After debating which doll to get, I received a French Trench as a present that year from my mom. I’ve been collecting since late 2007. How many Kenners do you have? How are they all different? 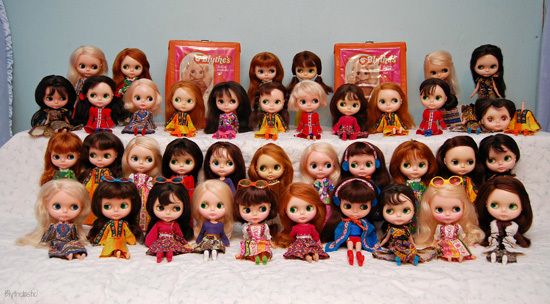 Currently, I have 38 Kenner Blythe dolls. I also have one ADG plus quite a few Neos, Middies, and Petites. Kenners are my favorite but I really enjoy all my dolls. Each Kenner is unique and has their own story. One of my Kenners is completely mint and was on display in a museum in Virginia for many years. While one of the other Kenners I have is completely yellowed and looks like the Malibu version of a Kenner Blythe doll. I find the stories that go along with each doll to be interesting. Even if I don’t have the interesting story of where the doll has been, I love to compare and see the similarities and differences. Some Kenners have bright blush and others have none. Some have giant ball of frizz for hair, others have no lips or cracks in their bums. Each doll seems so different to me that it can be a bit surprising to think some are considered the “same”. For example, if you compare two blonde, sidepart Kenner Blythe dolls, they should be pretty similar. However, I’ve found each are a fair bit different. Some are similar but no two are the exact same. Which Kenner of yours would you say has the most interesting story? It’s so difficult to choose! I have a Kenner that I’ve dubbed Frankie the FrankenKenner that I purchased on eBay. Frankie is from England and came to me in what most call her fat suit. She had nothing but her head and upper torso. All of her arms, legs, and bum were gone. Someone had replaced her lower half with a block of wood attached by five nails and wooden rods for legs. This was all cover in foam and a peach, skin tone fabric that resembles a Cabbage Patch Kid without feet. I knew I was purchasing a crazy Kenner but I was shocked when I saw Frankie for the first time. I laughed. I laughed a lot. I was able to restore her and found some Kenner parts, so Frankie is now all Kenner now. No wooden bits required. Sadly, I have no idea who or why poor Frankie was attached to a chunk of wood and hidden in a fat suit. What has been your luckiest find? Once upon a time, I found five Kenners on Craigslist. The photo in the listing was small and blurry but clearly five Kenners on a table: a redhead, two brunettes, a raven, and a blonde all in a row. I emailed that evening and called as soon as I got up the next morning. 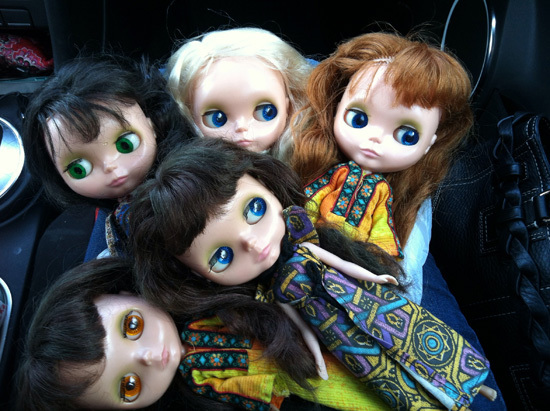 Within a few days, my mom and I were driving to Milford, a suburb of Cincinnati, to pick up five Kenner Blythe dolls. Based on the phone conversations I had with the seller, I knew it was a young man helping his mom sell her dolls. He said that his grandfather had worked for Kenner in Cincinnati. Based on hearing that, I was shocked and excited! The dolls were definitely Kenners, not Takaras as my mom had wondered, and were only an hour away. We drove down, paid and picked up the dolls. The entire way home, I couldn’t help but geek out. I was sick so the whole experience felt a bit surreal. It’s not everyday that you drive an hour and come home with five Kenners on your lap. These little ladies seem a bit different from my other Kenners so I believe they are probably some of the earlier produced dolls or something. They have a variety of differences such as very pink plastic, smaller faces, and thinner legs than my other girls. Out of all the Kenner hair colours, and hair styles, what would you say is your favourite and why? My favorite is always changing. I go through phases where all I want to photograph are my blondes then it will be all about the ravens and so on. I don’t think I have one favorite. Overall, I like coarser hair texture better. My first Kenner, Aurora, is a side part blonde with coarse hair and I love it. It’s more difficult to tame the frizz on coarse texture Kenner hair but the results are gorgeous. If you were a child in 1972, do you think you would have enjoyed Blythe as much as you do now as an adult? I like to think I would have liked them. I liked dolls as a child and then went trough a phase where I pretended not to. 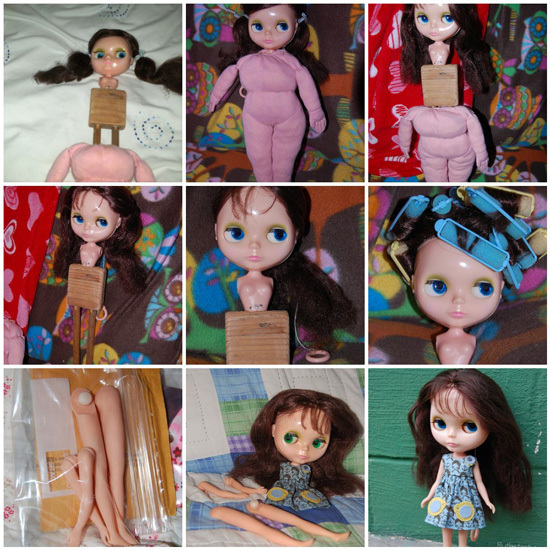 I like Blythe because people find her creepy; I find that a little funny! When I was little, I liked dolls. 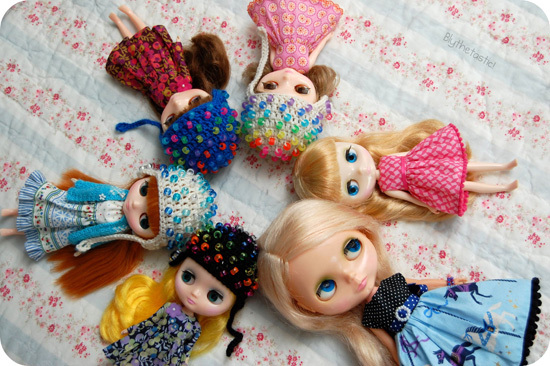 With all of those dolls – Kenners and otherwise – do you have a favourite? Who is it? I don’t think I have one favorite. I don’t think I could choose! There are a handful of favorites though. The two dolls I had signed at the BlytheCon panel are pretty special to me. 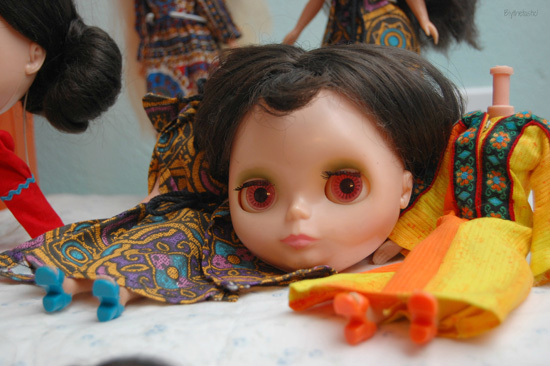 I had my first Blythe doll, a French Trench called Josephine, and a Kenner, mint condition raven called Francis, signed. Do you still actively hunt for Kenners? Is there a specific type that you look for? I keep an eye out but I don’t know that i’m actively hunting for Kenners as much. I have a checklist of Kenners that I would eventually like to get so I keep an eye out. I’m not currently looking for anything specific. I still hope to find a bargain Kenner and dream of owning one that is NRFB. Hopefully someday! Thank you so much for doing this interview with me, Becca! 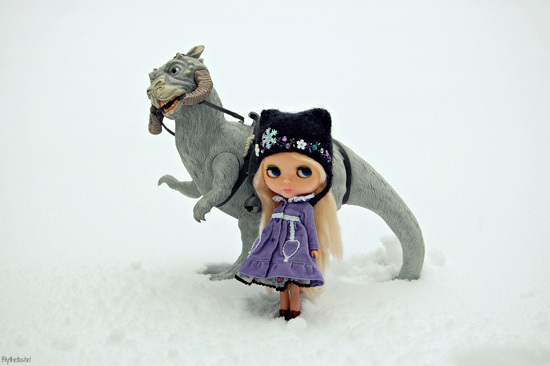 Do you have any advice for that Blythe hobbyist who’s on the hunt for their first Kenner Blythe? Advice wise, I’d say patience is important. I think you can really get a great deal on a Kenner if you’re patient. I’d suggest looking at some Kenners and knowing what you’re comfortable with and/or what would need to be restored for you to love you new doll. Kenners are rarely in perfect condition and I believe that’s part of their charm. I love doing interviews with members of the Blythe community! If you’re interested in being featured on BlytheLife.com, let me know! Question of the Week: Are there any “original” names left?